The US Patent and Trademark Office on Tuesday issued Apple a patent for a system that utilizes near field communications to activate device-to-device data syncing, much like the so-called "S Beam" feature found on certain Samsung Galaxy smartphones. Apple's US Patent No. 8,458,363 for a "System and method for simplified data transfer" is a massive 84-page patent describing a number of ways in which wireless data syncing between two electronic devices can be accomplished. 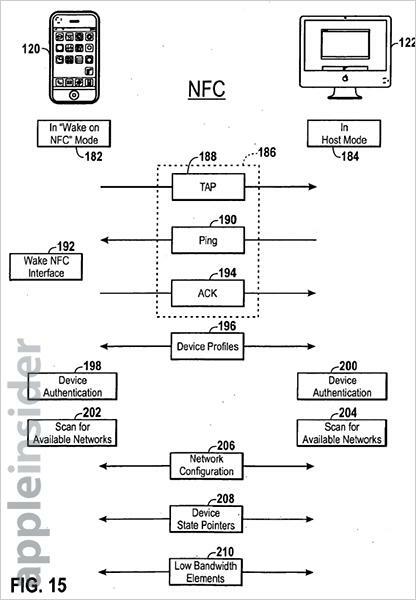 Of note, the property calls for the use of NFC components, which have yet to appear in Apple's product lineup. 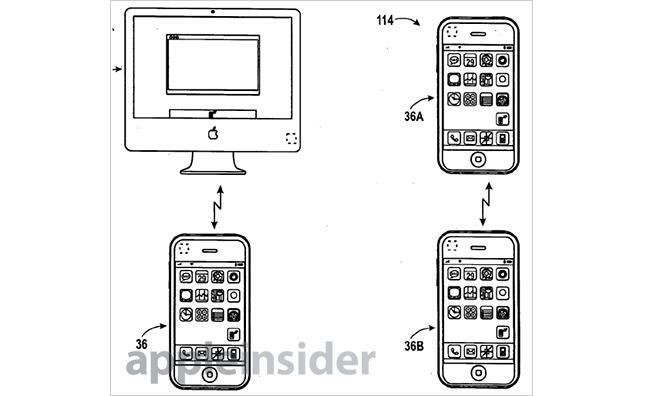 The patent was first outlined by AppleInsider when the property's application was published in 2009. At the time, the filing showed promise as an easy method to swap files to and from various devices, especially given its ability to move data cross platform. A method of performing the simplified data transfer may include initiating communication using near field communication (NFC) between two devices. Next, data associated with open applications on one of the two devices may be saved and then transferred to the other. Transferring the data may take place using a peer-to-peer connection other than via NFC. 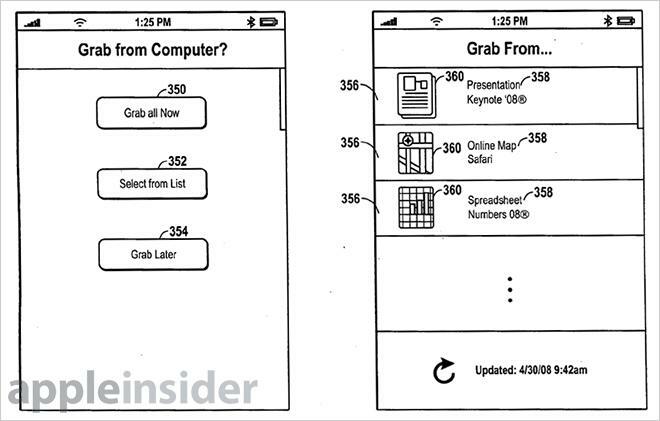 For example, in one embodiment of the patent, a user can "tap" their NFC-toting iPhone to a similarly equipped Mac to initiate the transfer of wireless network data. Once the Wi-Fi network configuration information is received, files like a Keynote presentation can be transferred from the Mac to the iPhone. Any number of NFC-enabled devices and file formats can be used in Apple's system, including the Apple TV and remote, a video game controller, Macs, iPhones, and more. In the patent language, two illustrative apps called "Grab & Go" and "Revisit" described possible mobile functions like syncing data from open applications on another device, and storage of data in the cloud. When the application was first published, NFC was an outlier in American consumer products. The technology did have a following in countries like Japan, however, where contactless data transfer solutions like Sony's Felica RFID systems were  and still are  in wide use. More recently, Samusung introduced a similar method of data transfer in its "S Beam" feature, which itself is built on Google's Android Beam utility. While the basic Android version relies solely on NFC as a mode of transport, S Beam is more in line with Apple's granted patent in that NFC is used to initiate an ad hoc wireless connection. With Samsung's implementation, users can tap their phones together to share photos, video and other media, as well as activate advanced device-to-device functionality. 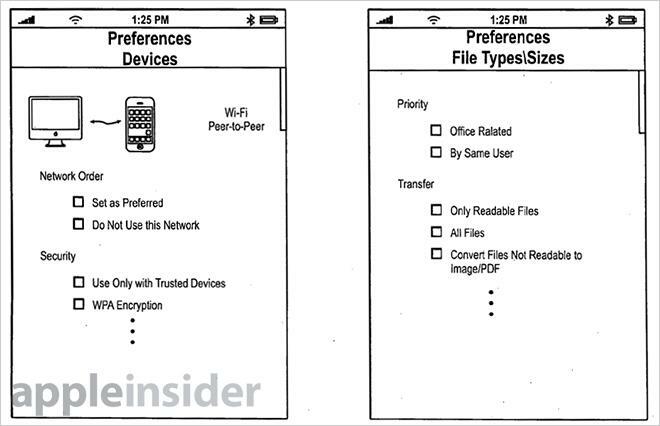 Apple's patent also describes such usage, including peer-to-peer applications, but extends further by including support for a multitude of file types including music. Among the patent's credited inventors is former Apple executive Tony Fadell, known as the "grandfather of the iPod" and cofounder of thermostat maker Nest. Along with Fadell, the patent credits Michael Rosenblatt, Gloria Lin, Amir Mahood Mikhak, Taido Lantz Nakajima, Sean Anthony Mayo and Andrew Hodge as its inventors.